Our dogs are beautiful in type, healthy in genetics and sound in temperament. We make every effort to breed strong healthy puppies from excellent top producing bloodlines. Our ancestry goes back to the great VA1 Uran vom Wildsteiger Land, the two time sieger in 1984 & 1985, VA2 (I) Vopo vom Kirschental, V Rocco vom Haus Stoppache and V Excalibur de la Ptite Flore, VA1 Wupp von der Urbecke SchH3 Kkl. 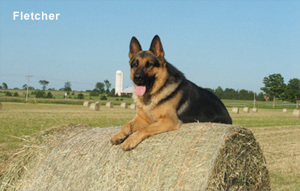 Our breeding program follows Germany's Standard of Excellence. We produce males that have large masculine heads, dark eyed, big boned, and are rich in color. We breed black & tans and sables. Our dogs are bred for intelligence, loyalty and are perfect family pets. 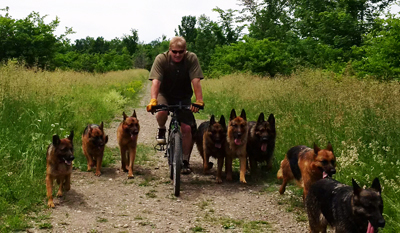 Since 1985, we have placed dogs as Hospital Therapy dogs (MS), with police forces and Ministry of Natural Resources Ontario, working farms and many happy families. 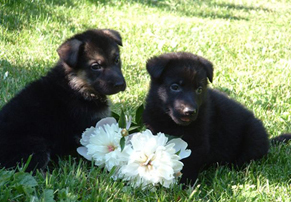 All puppies are sold with a written health/hip and a CUSTOMER SATISFACTION guarantee. Puppies are home raised, have had a minimum of two sets of shots and are de-wormed every few weeks. Pups have a free microchip ID and are sold with a Crosshill Kennel Dog Owner’s Manual. Crosshill Kennels is located on a fifty acre property.